Are you looking for a new home and a cool job? 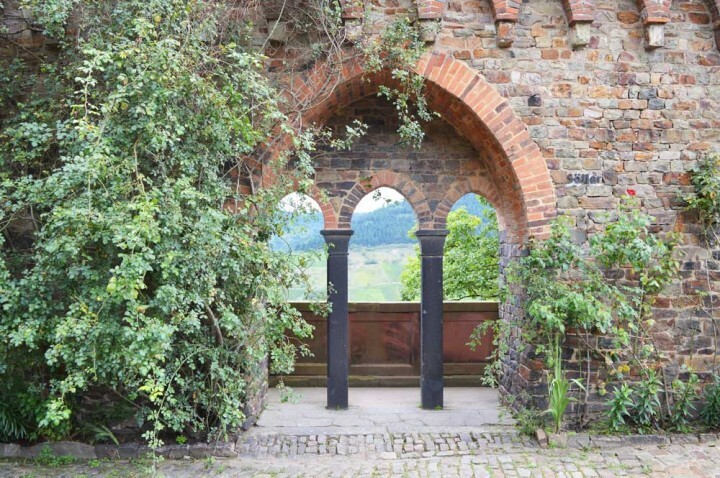 Then maybe this is for you: The Middle Rhine region and its main newspaper, the Rheinzeitung are currently searching for a castle blogger who will move into Sooneck Castle for six months over the next summer. Writing in the castle gardens? Tweeting from the tower? Sounds great, doesn’t it? I have taken a closer look at the castle and its surroundings last weekend and daydreamed a little. How would it feel to live as a damsel between modern media and medieval walls? Tiny towns pass by the window, their colorful houses lined along the street as pearls on a string. Next to us is the Rhine, on the other side, mountains. Every turn offers an even better view on the picturesque landscape. As we leave Bingen behind, the road narrows. There is only one route to get further into the Middle Rhine region. The B9 meanders along the Rhine, forested hills shield the sight to the left side of the road. Tiny towns, squeezed between the road and the mountains, pass by the car window, their small, colorful houses lined along the street as pearls on a string. You know what I’m talking about if you have ever been to the region. There aren’t many places like that in Germany. A lot of cars have license plates from other regions, giving them away as tourists. They come from Frankfurt, Ludwigshafen, Cologne. We are lined up behind a caravan from Hamburg. There isn’t much bustle on the rail tracks between the road and the river. It’s a Sunday. On weekdays, wagon trains frequent the tracks minute by minute. The steep rocks echo their noise. Today, Sunday drivers make for another annoyance on the street. The Middle Rhine region is home to one of the most scenic roads in Europe. Every turn offers an even better view on the picturesque landscape. On this two-lane road, passing is near to impossible in weekend traffic. 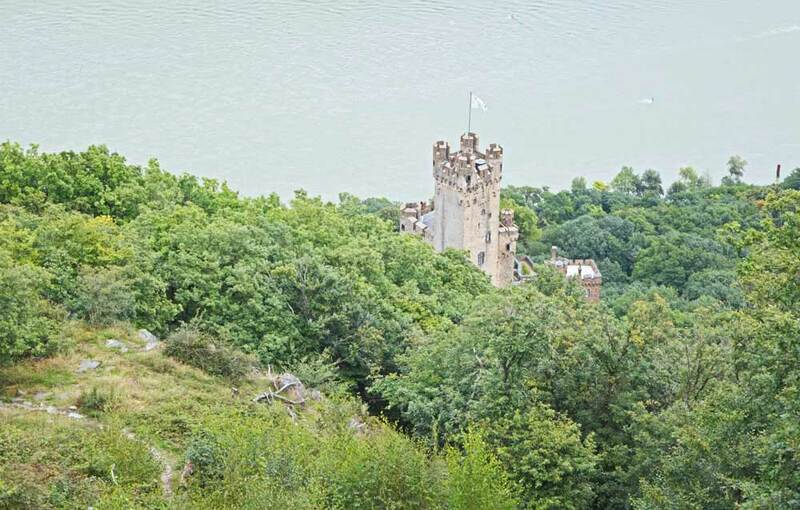 Life in the Middle Rhine Valley is squeezed between the river and the hills, life reality in a magical backdrop. Small towns, a road, tracks: signs of civilization in a pristine surrounding. 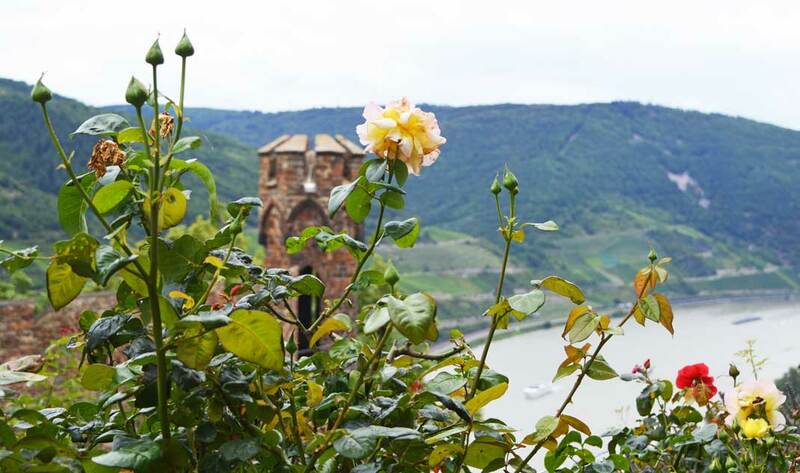 Tourists love the Middle Rhine Valley, home of the Loreley. It symbolizes German Romanticism – which is a marketing bestseller in tourist agencies overseas, where history is young and myths are few. 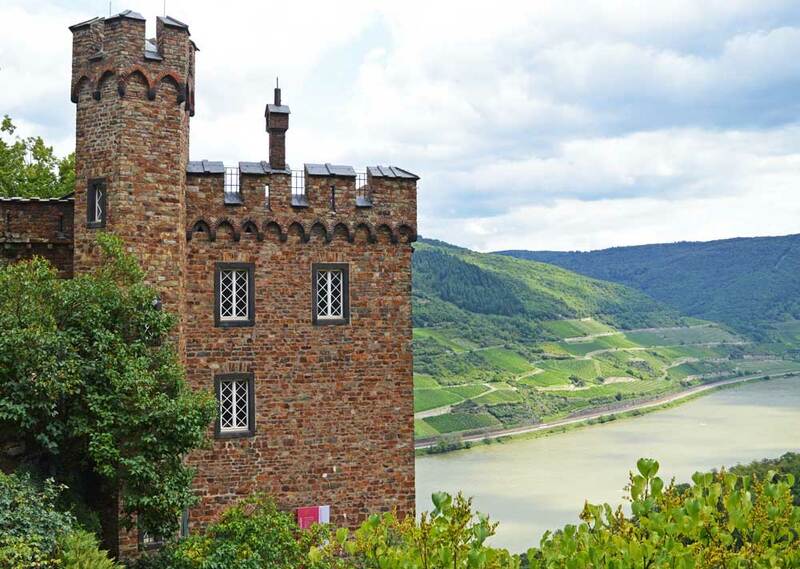 Thanks to Clemens Brentano, the Middle Rhine Valley is part of Romantic Germany. The poet could know nothing about the problems the region would have to fight decades later when he first published his ballad of Lore Lay, the woman that was believed to be a witch for her appeal to men – and who drowned herself in the river over lovesickness in 1802. The saga was an instant success and lured people to the Rhine valleys even then. In 1862, the first train connected the Middle Rhine with the rest of the world, making for a comfortable journey into the region. And maybe this is where it all began. Near Niederheimbach I reach my destination. Sooneck Castle is one of many castles that line up on both sides of the Rhine. Majestically, it sits above the river, a former home of robber barons. A narrow road leads to the castle estate, the last quarter mile of which can only be covered by walking. Imagine the Middle Ages and think about a knight’s castle and Sooneck is exactly what you will picture. It rises out of the woods before you notice that you have reached it. Roses entwine around its outer walls and on the well-kept flowerbeds inside. I find myself strolling through the castle gardens as if I was damsel Anna in a long, flowing medieval dress, taking a critical look at my own front garden and its roses, lavender, and nasturtium. I am carefully eyeing doors and walls. This is nice and cozy. Still it might get pretty cold in winter, despite thick walls. The last inhabitants of Sooneck Castle didn’t wear medieval clothing by the way. Instead, they wore sleek uniforms, as it was quite common for royalty in the late 19th century. Technically speaking, Sooneck Castle is not a medieval castle, too. It is a romantic one. Its last owner, crown prince Friedrich Wilhelm IV. of Prussia better known as the man who refused the imperial German crown in front of the National Assembly in 1849, had the castle ruin rebuilt from 1843 on as a faithful copy of the medieval original. But he also added some parts: The big wall that shelters the castle from the Rhine and the big outdoor deck were added in the era of Romanticism and thus, a great part of Sooneck Castle is only seemingly a medieval castle. In reality, it is hardly older than 150 years. This part of the castle is going to be the castle blogger’s home. By now there is nothing on the floor above the tavern to which he or she will move. Except the view, which is gorgeous. A quarry to the Southeast might disturb the view a bit. But then again, I like quarries. And the view to the Northeast – where the Rhine flows – will completely make up for that anyway. The rest is forest, vineyards and mountains with the occasional small town at their feet. No need to complain. Well, it might be a bit lonely up here. It might be nice to have a dog as your companion. But well, there are the tourists, the inhabitants of Niederheimbach and all the other small towns in the region. There is the ferry across the river that connects the Rhine steep path with the castle hiking trail – two of the most beautiful hiking routes in Europe, an enormous net of hiking trails and scenic lookouts. There are wine festivals and cultural events. And there are people that care for the region – people that are organized in citizens’ initiatives to enhance the quality of living in the Middle Rhine valley. People who care to uphold traditions – not only for the tourists but for themselves as well. Each and every one of them has a story to tell. I would like to give them a voice. I have fallen in love with this region and with the people I met. Do you like the idea of moving into Sooneck Castle? If you do and if you happen to speak German, you can apply until September 14. You’ll have to write daily and get an allowance of 2000 Euros per month. Find out more bout the job here. Sooneck Castle opens daily (except Monday) from 9 am to 6 pm. 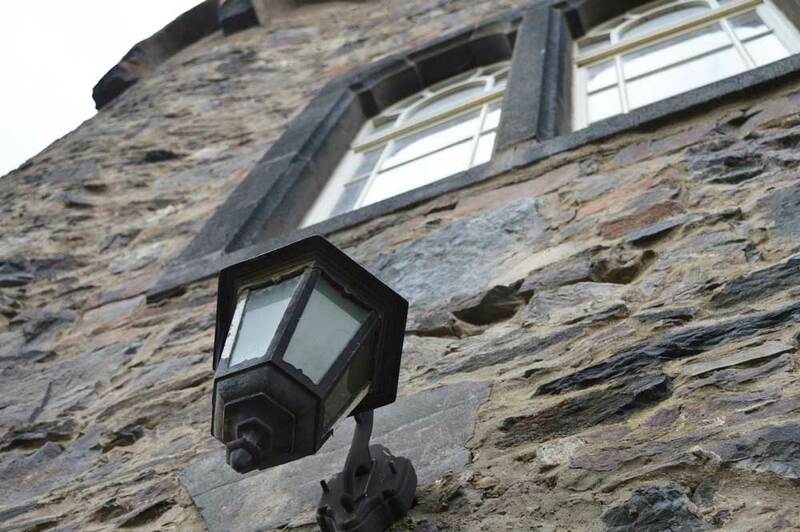 The entrance fee is 4 Euros and includes a tour through the interior of the castle.